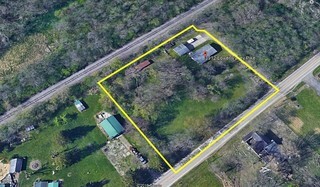 This property sells at Public Auction on Wed, December 5 at 4 pm. Great potential with this 1.52 acre property including a 1-story home with 4 bedrooms, 2 full baths, living room, kitchen, dining room, full unfinished basement & 1,404 finished square feet. The property also includes a nice 24×24 2-car detached garage with concrete pad/patio, 2 small sheds for your livestock & fenced pasture. Very scenic, private & surrounded by woods. The property sells in “as is” condition. Call Auction Agents or visit on the web for complete terms and free Bidder Package. Don’t miss a great opportunity! No financing or other contingencies permitted. Sells subject to seller confirmation. Bidding Procedure: The property sells to the highest bidder sub-ject to Seller’s confirmation. Acceptance of Bid Prices: The successful bidder will sign a Con-firmation of Sale Agreement at the auction site immediately follow-ing close of bidding. Down Payment: $5,000 down payment day of auction upon sign-ing of Confirmation of Sale Agreement; balance due at closing. Bidding IS NOT CONDITIONAL UPON FINANCING. Closing Date: On/before January 9, 2019. Purchaser will pay customary portion of closing costs at closing. Closing will be trans-acted by City Title Agency, Springfield, OH, unless otherwise agreed by the contracting parties. Disclaimer and Absence of Warranties: All information con-tained in this brochure and all related materials are subject to the terms and conditions outlined in the Confirmation of Sale Agree-ment. Announcements made by the Auctioneer at the time of the Auction will take precedence over any previously printed or oral information. The property is sold on an “AS IS, WHERE IS” basis, and no warranties or representations, either expressed or implied, concerning the property are made by the Seller or the Auction Company. Each bidder is responsible for conducting his/her own independent inspections, investigations, inquiries, and due dili-gence concerning the property. The information contained in this brochure is believed to be accurate, but is subject to verification by all parties relying on it. Neither the Seller nor the Auction Company assumes liability for its accuracy, errors, or omissions. Conduct at the auction and increments of bidding are at the direction and dis-cretion of the Auctioneer. The Seller and the Auction Company reserve the right to preclude any person from bidding if there is any question as to the person’s credentials, fitness, legal capacity, etc. All decisions of the Auctioneer are final. From I-70 near Springfield, go north on US 68 to west on State Route 4. Exit onto Lower Valley Pike to property. State Route 4 near Enon, go east on SR 4 to Lower Valley Pike exit. Go east on Lower Valley Pike to property. Watch for signs.